Václav Havel Airport Prague (Czech: Letiště Václava Havla Praha), formerly Prague Ruzyně International Airport (Czech: Mezinárodní letiště Praha-Ruzyně, Czech pronunciation: [ˈpraɦa ˈruzɪɲɛ]), (IATA: PRG, ICAO: LKPR), is the international airport of Prague, the capital of the Czech Republic. 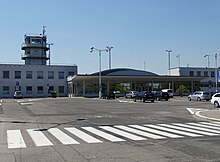 The airport was founded in 1937, when it replaced the Kbely Airport (founded in 1918), it was reconstructed and extended in 1956, 1968, 1997, and 2006. It is located in the edge of Prague-Ruzyně area, next to Kněževes village, 12 km (7 mi) west of the centre of Prague and 12 km (7 mi) southeast of the city Kladno. Due to insufficient capacity of Kbely Airport by the mid-1930s, the government decided to develop a new state civil airport in Ruzyně. One of the major awards Prague Ruzyně Airport received include Diploma and Gold Medal granted in 1937 at the occasion of the International Art and Technical Exhibition in Paris (Exposition Internationale des Arts et Techniques dans la Vie Moderne also known as Paris 1937 World's Fair) for the technical conception of the central airport, primarily the architecture of the check-in building (nowadays known as Terminal 4) designed by architect Adolf Benš. 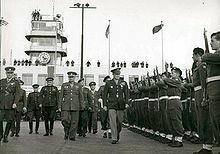 In one of the most dramatic moments in its history, the airport was seized by Soviet paratroopers on the night of 20–21 August 1968, who then facilitated the landing of Soviet troops and transports for the invasion of Czechoslovakia. Moreover, the Ruzyně fields provide opportunities for further expansion of the airport according to the increasing capacity demand. 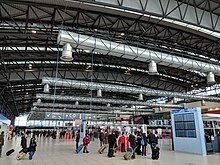 The airport serves as a hub of the trans-European airport network. The political and economic changes affected the seventy years of existence of Prague–Ruzyně Airport. Some new air transportation companies and institutions were founded and some ceased operation since then. Ten entities have been responsible for airport administration over time, including the new construction and development. Until the 1990s, there were two or three-decade gaps before the major modernisation of Prague–Ruzyně Airport began to match the current capacity requirements. An online petition organised by one of the best-known Slovak film directors, Fero Fenič, calling on the government and the Parliament to rename Prague Ruzyně Airport to Václav Havel International Airport attracted – in just one week after 20 December 2011 – the support of over 65,000 signatories both within and outside the Czech Republic. A rendition of the airport with the proposed Václav Havel name in the form of his signature followed by his typical heart symbol suffix was included in the blog's article in support of renaming of the airport. This name change took place on 5 October 2012 on what would have been Havel's 76th birthday. However, the PRG name of the airport for IATA and ICAO will remain the same. 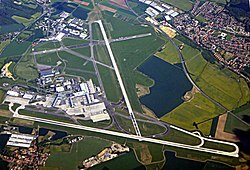 As the capacity of the airport has been reaching its limit for the last couple of years (as of 2005), further development of the airport is being considered. Besides regular repairs of the existing runways, Prague Airport (Czech: Letiště Praha s.p.) began the preparations for building a new runway, parallel to the 06/24 runway. The construction with estimated costs of CZK 5–7 billion was scheduled to begin in 2007, and the new runway marked 06R/24L (also called the BIS runway) was to be put into service in 2010. However, because of many legal problems and the protests of people who live close to the airport premises, the construction has not yet begun. Despite these problems, the project has support from the government, and is expected to be completed by the end of 2014. Prague Airport states that besides increasing the airport capacity, the new runway system will greatly reduce the noise level in some densely inhabited areas of Prague. This should be achieved by reorganising the air traffic space around the airport, and shifting the traffic corridors after putting the two parallel runways into service. The vision of heavy traffic raised many protests from the suburban communities directly surrounding the airport. On 6 November 2004, local referenda were held in two Prague suburbs – Nebušice and Přední Kopanina – giving official support to the local authorities for active opposition against the construction of the parallel runway. The company operating the airport is Prague Airport (Letiště Praha, a. s.), a joint-stock company that has one shareholder, the Ministry of Finance. The company was founded in February 2008, as part of a privatisation process involving the Airport Prague (Správa Letiště Praha, s.p.) state enterprise. This action was in accordance with the Czech Republic Government Memorandum Nr. 888, which had been passed on 9 July 2008. On 1 December 2008, Prague Airport took all rights and duties formerly held by Správa Letiště Praha, s.p., and Prague Airports took all business authorisations, certificates, employees, and licenses from the former company. The head office of Prague Airport is in Prague 6. The former state-owned enterprise had its head office on the airport property. A Czech Railways public bus service, AE – AirportExpress, connects Terminal 1 with Praha hlavní nádraží. From bus station in front of Terminal 1 there are also regular buses to Kladno, intercity buses of Regiojet run every 30–60 minutes to Karlovy Vary and Cheb. On 30 October 1975, Inex-Adria Aviopromet Flight 450, a Douglas DC-9-32 hit high ground during an approach in fog to Prague Ruzyně Airport. 75 of the 120 passengers and crew on board were killed. On 29 March 1989, two teenagers from Czechoslovakia armed with grenades and shotguns hijacked Malév Flight 640 at Prague Ruzyně Airport, and forced the Tupolev Tu-154B with 15 hostages to fly to Frankfurt Airport in West Germany before surrendering. ^ "K 13 milionům letišti pomohly větší a obsazenější letadla i novinky v nabídce destinací | Letiště Václava Havla Praha, Ruzyně". Prg.aero. Archived from the original on 31 January 2017. Retrieved 29 March 2017. ^ "Václav Havel Airport Prague Exceeds 12 Million Passengers Handled a Year | Václav Havel Airport Prague, Ruzyně". Prg.aero. Retrieved 29 March 2017. ^ a b c "AIP Czech Republic Praha/Ruzyně" (PDF). Retrieved 2 April 2017. ^ "Rekordní rok pro pražské letiště? Odbavit má přes 17 milionů lidí, otevře novou komerční zónu". iROZHLAS (in Czech). Retrieved 9 January 2019. ^ "Letiště Václava Havla". 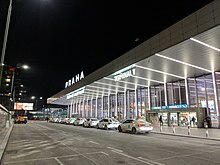 Vaclavhavelairport.com. Retrieved 29 March 2017. ^ "Blogy a názory - Aktuálně.cz » Chyba!". Blog.aktualne.centrum.cz. Retrieved 29 March 2017. ^ "Parallel runway | Václav Havel Airport Prague, Ruzyně". Prg.aero. Retrieved 29 March 2017. ^ "Předplatné MF DNES". Zpravy.idnes.cz. 17 August 2009. Retrieved 29 March 2017. ^ "Generální oprava | Letiště Václava Havla Praha, Ruzyně". Prg.aero. Retrieved 29 March 2017. ^ "Main Runway at Václav Havel Airport Prague Now Back in Service | Václav Havel Airport Prague, Ruzyně". Prg.aero. 30 September 2013. Retrieved 29 March 2017. ^ "Jak se začalo létat z našeho největšího letiště a co ho čeká do budoucna". iDNES.cz. 5 April 2017. ^ "About us | Václav Havel Airport Prague, Ruzyně". Prg.aero. 1 December 2008. Retrieved 29 March 2017. ^ "Contacts | Václav Havel Airport Prague, Ruzyně". Prg.aero. Retrieved 29 March 2017. ^ "Letiště Praha, s.p. - Základní informace". Web.archive.org. 29 August 2006. Archived from the original on 29 August 2006. Retrieved 29 March 2017. ^ "Luxair Resumes Prague Service from late-Mar 2016". Routesonline.com. Retrieved 29 March 2017. ^ Milan Hnátek. "Pegasus ještě nezačal létat a již fvyvolal rozruch". ČeskoTurecko.cz. Retrieved 3 June 2015. ^ "Ryanair Launches Record Prague Summer 19 Schedule". Ryanair. Retrieved 26 September 2018. ^ a b c d e f "Flight schedule". smartwings.com. ^ "Ural Airlines schedules new Moscow Zhukovsky – Europe routes from Dec 2018". routesonline.com. Retrieved 25 September 2018. ^ a b c "Airport: Praha-Ruzyne NUMBER OF PASSENGERS" (PDF). Prg.aero. Retrieved 29 March 2017. ^ "Airport: Prague-Ruzyne, NUMBER OF AIRCRAFT MOVEMENTS" (PDF). Prg.aero. Retrieved 30 March 2017. ^ "Airport: Praha-Ruzyne NUMBER OF AIRCRAFT MOVEMENTS" (PDF). Prg.aero. Retrieved 30 March 2017. ^ "Prague Airport Traffic Report 2006" (PDF). Prg.aero. Retrieved 29 March 2017. ^ "Prague Airport Traffic Report 2007" (PDF). Prg.aero. Retrieved 29 March 2017. ^ "Prague Airport Traffic Report 2008" (PDF). Prg.aero. Retrieved 29 March 2017. ^ "Prague Airport Traffic Report 2009" (PDF). Prg.aero. Retrieved 29 March 2017. ^ "Prague Airport Traffic Report 2010" (PDF). Prg.aero. Retrieved 29 March 2017. ^ "Prague Airport Traffic Report 2011" (PDF). Prg.aero. Retrieved 29 March 2017. ^ "Prague Airport Traffic Report 2013" (PDF). Prg.aero. Retrieved 29 March 2017. ^ "Prague Airport Traffic Report December 2015" (PDF). Prg.aero. Retrieved 29 March 2017. ^ "Prague Airport Traffic Report December 2016" (PDF). Prg.aero. Retrieved 29 March 2017. ^ "Prague Airport Traffic Reports | Václav Havel Airport Prague, Ruzyně" (PDF). prg.aero. ^ "Traffic Report - December 2018" (PDF). Prague Airport. Retrieved 28 January 2019. ^ "Traffic Report 2019" (PDF). Prg.aero. Retrieved 5 February 2019. ^ "Imprint Archived 1 April 2010 at the Wayback Machine." Czech Airlines. Retrieved on 4 February 2010. "Letiště Ruzyně Prague 6 160 08 Czech republic"
^ "Contacts." Travel Service Airlines. Retrieved on 14 November 2011. "Travel Service, a. s. K Letišti 1068/30 160 08 Prague 6 Czech Republic"
^ "Accident Details : Cairns Airport : Commair". Planecrashinfo.com. 23 October 1975. Retrieved 30 March 2017.